When visiting the Nordkapp area, you should take advantage of the culinary fish opportunities. The Nordkapp area is famous for its fish. Although some fish dishes require an acquired taste, it is very nutritious. The food culture is unique. And, the best part: You can get it fresh in Nordkapp. 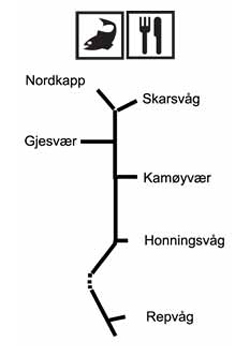 Here is our recommendations for a culinary fish adventure from north to south in the Nordkapp area. Midnattsol Camping – A fantastic buffet every night from 18.00 to 21.00 including appetizer, fish, dessert and coffee (10. June – 10. August, 2010). Kirkeporten Camping – Delicious salmon meal every night. May 1 – October 1. North Cape Christmas and Winter House – Fish soup. Nordkapp Turisthotell – Fully licensed restaurant “Kapphorn”, seats for 60 guests. Their specialty is fish from the rich fishing fields of North Cape. Barents Cabin & Cruise (Bokta Grill) – High quality fast food with their special fish burger and fish beef. 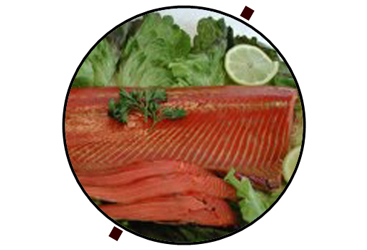 Kjell-Ove Jensen – The ultimate salmon treat: Smoked wild salmon. Corner – Café with a full menu. “Arktisk Meny». Destinasjon 71′ nord – King crab in lavvu (groups). Repvåg Fjordhotell & Rorbusenter – Fantastic fish menu in a genuine reconstructed fishing wharf. You can also eat your own catch. What is your favorite fish receipe?